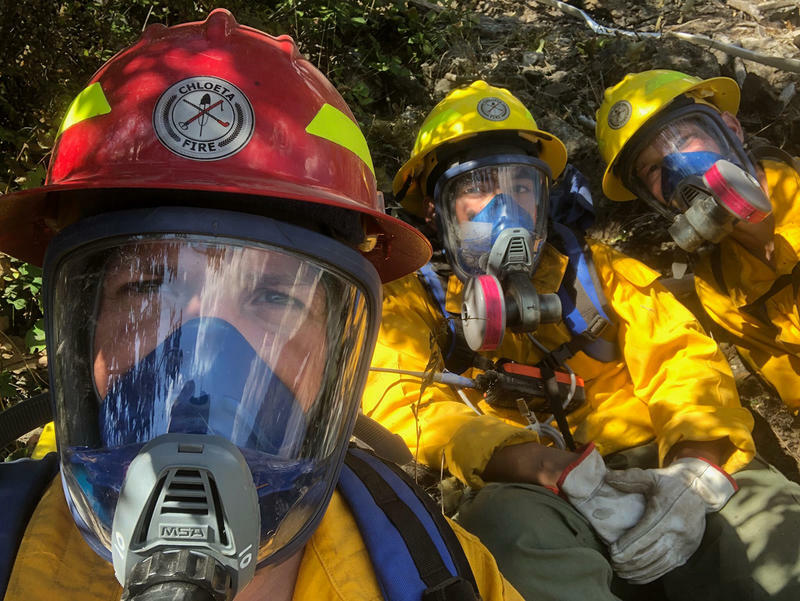 Members Of The Chloeta crew, Nolan Buckingham, Jaime Garcia and Aaron Turner at the Highway 37 fire near Libby, MT. The so-called Rainbow Passage, read by one of the engine crew members, is part of how a team of specially-trained firefighters make sure the respirator creates a full seal to protect their lungs from microscopic asbestos fibers, the same fibers that miners at the old W.R Grace vermiculite mine unknowingly carried home to their families for decades before succumbing to lung cancer and asbestosis. "Once we make that commitment to don those masks, a time clock starts," says Nolan Buckingham. Buckingham is the superintendent of the Chloeta [shuh-LAY-tuh] crew, a 10-person team out of Oklahoma contracted to suppress fire starts in and around Libby’s modified response zone. Buckingham says fighting the Highway 37 Fire is slow going, filled with double-checking procedures and equipment. "It's a continual self-evaluation and evaluation of the crew on just their physical status, their fatigue." Breathing in the respirators only delivers about 60 to 70 percent of normal airflow. It takes twice as long to complete normal tasks like digging handline or sawing a snag, and calling for backup or more supplies isn’t an option. "We have to minimize the exposure that we then take with that mask and also try to minimize that timeframe because then it's coming back down and going through that entire decon process," Buckingham says. The decontamination process is the final step each day. It’s a two-part shower in a trailer in the woods, where a separate team guides the firefighters through step-by-step. "Think of it as like going through the airport but throwing a shower at the end of the metal detector. Once you get through there, you're free to go," says Buckingham. Jake Jeresek, a fire management officer on the Flathead National Forest, heads up the decontamination effort. "Anything that goes in needs be cleaned," Jeresek says. The firefighters’ bodies, their face masks, handtools, cell phones, clothes – even dollar bills in their wallets need to undergo three rinses or get thrown away as hazardous waste. Jeresek says that for now, only the firefighters and a few pieces of hand equipment go through the full cleanup. Bigger equipment stays in the dirty zone. It takes three to four hours to decontaminate just the firefighters. He says after the fire is contained, they’ll turn their attention to bigger equipment, like skidgeons and trucks. "All our hose, pumps, chainsaws, everything." Then the decon crew, which also wears respirators when they’re working in the dirty zone, will spend eight to 12 hours a day power-washing and rinsing. "It's a long process," Jeresek says. "Even after this fire is long and over we'll be decontaminating for a week to 10 days beyond that, just the equipment." These protocols have been in place for a couple of years, but this is the first fire that’s really tested a coordinated, sustained response. "We weren't quite prepared for something of this size,"says Jeremy Nelson. "We have a heavy reliance on air resources; helicopters and airplanes. That's typically our first response," Nelson says. 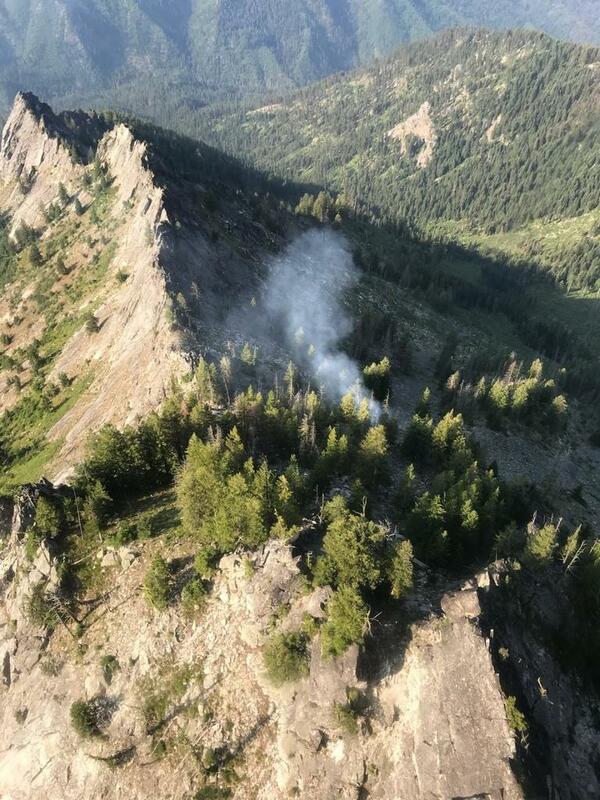 At one point last week, the Flathead Beacon reported eight helicopters and nine fixed wing aircraft dropped hundreds of thousands of gallons of water. Nelson says that helps stamp out hot spots and keeps the dust down. 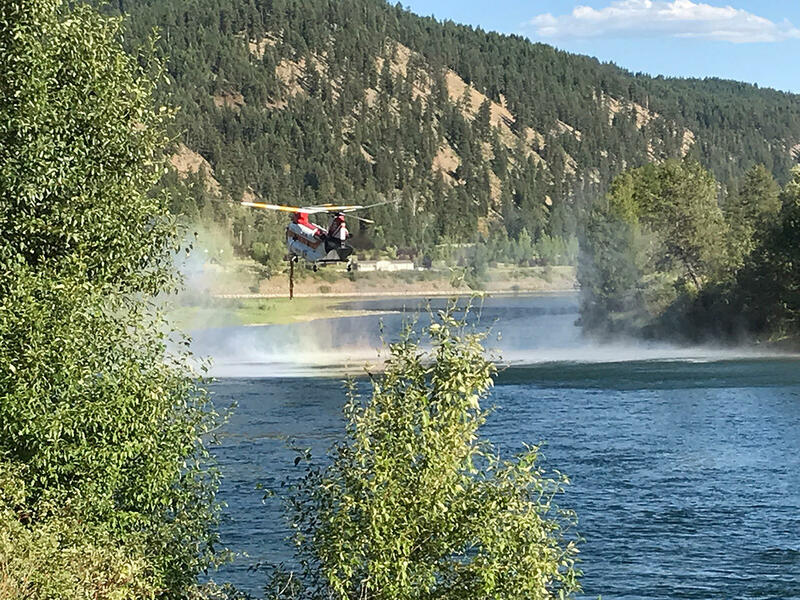 A helicopter fills up on water while fighting the Highway 37 fire near Libby, July 2018. Christina Progess with the U.S. Environmental Protection Agency says that dust presents the biggest concern for exposure. "Asbestos is a little bit different than most contaminants," Progess says. "You can't just take a sample from the media, say soil or duff for instance. You have to take what people are actively breathing. So you have to disturb the soil. That kicks it into the air. That air is what you breathe and that air is what you sample." She says firefighting is a particularly dusty and breathy activity. "Firefighting, you're exposed to not only the soil, but the ash, so the bark and duff get burned during a fire and that forms ash. That ash mixes with the soil as your firefighters are conducting mop-up activities or fireline digging, you know, typical firefighting activities. As they’re digging through that material, that creates a lot of dust, and that dust is what they breathe." At the same time, Progess says the fire, a mile-and-a-half from the mine site, is far enough away that she’s not too worried for the firefighters. The amount of fibers in the duff and bark is relatively low. "It's outside Operable Unit 3. It's in a lower concentration area," she says. She’s also not too concerned about asbestos-contaminated smoke expanding exposure risk to nearby towns. She points to lab studies, where scientists burned duff and bark from near the mine site to see how much asbestos would be carried in a smoke column. "What we've seen is that greater than 95 percent of the asbestos remains in the ash. very little actually gets liberated into the smoke, which is good news for downwind communities." A bigger risk is ash running off into creeks and streams and depositing asbestos there. 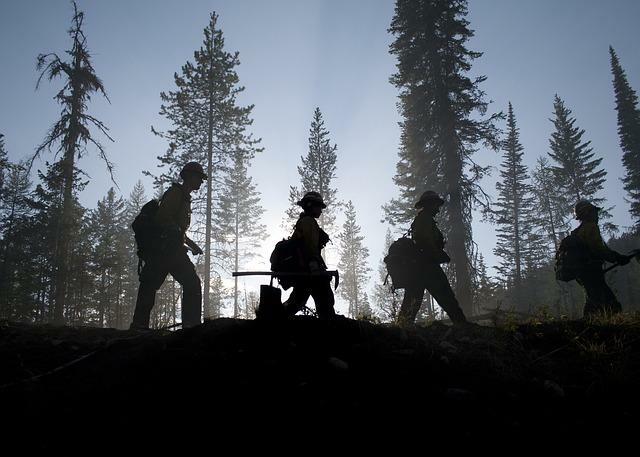 Progess says analyzing that risk will be part of the Forest Service’s post-fire response. She says the Service has done a great job keeping the fire out of the mine site. "I think the Forest Service has done an incredible job managing the fire, keeping the fire as small as possible, managing for smoke and things like that." For Chloeta contract team supervisor Nolan Buckingham, the added challenges fighting fire around Libby is the reason to be here. "It's another level to complexity and it's another level in their career that they accept those inherent risks, and that's why we're able to recruit people," he says. But Jake Jeresek with the Flathead National Forest says it’s a tougher proposition to ask locals to volunteer for the respirator training. We've been trying to recruit firefighters for over a decade, and people come, people go. And it's been a very tough proposition to get firefighters that want to go in there." He says there’s about 20 U.S. Forest Service personnel nationwide who’ve volunteered for the training. A handful of them are local and fighting the Highway 37 Fire. 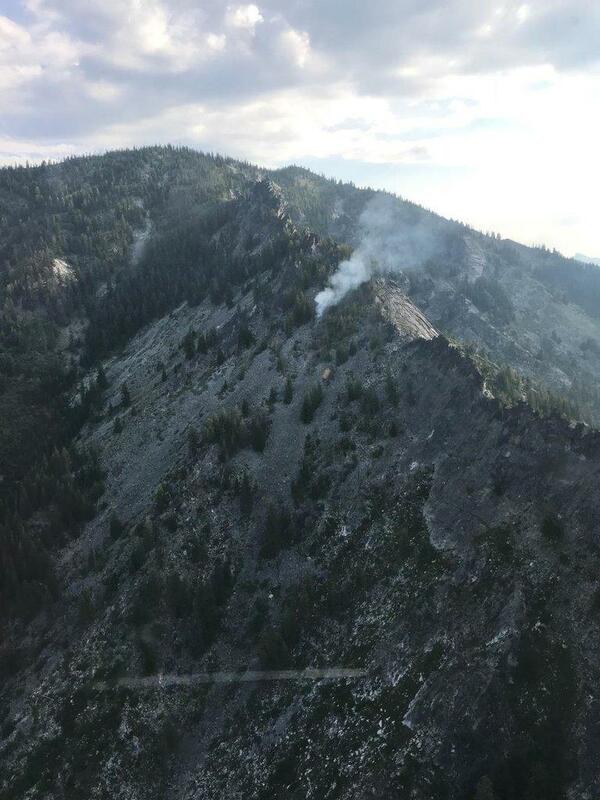 The fire is about 70 acres and 10 percent contained as of Wednesday afternoon.